Necromutant number two, complete with stiches in the skull and a missing tooth. For some reason the first one is wearing a mask. MotoGP returned today after what felt like a never ending winter off season. The MotoGP race was an epic event with Doctor Rossi on his Yamaha winning the first round in Qatar from Dovizioso on the Ducati. Can Rossi continue this year to reach his 10th championship in his 20th season? Current champion Marquez made an error in turn one to run off track but hit 217.66 mph in his attempt to catch up, the highest speed ever recorded in a MotoGP race. It has been a tough week. Real work took over big time and I have been away and busy. The only new stuff to share is the undercoated Land Train. It is big, it is green and quite awesome. 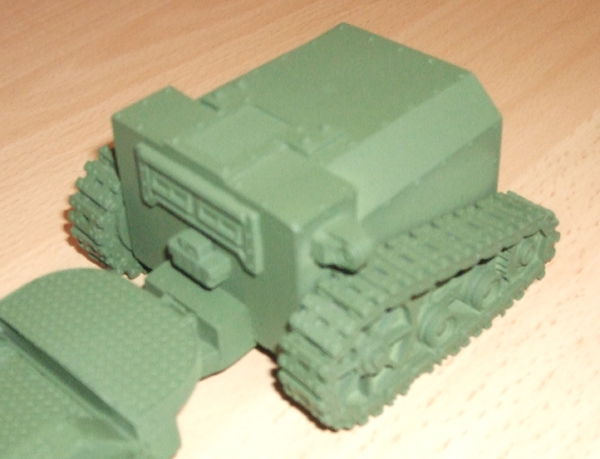 The Land Train will be painted to match the Stug/Pugs so there are plenty of rivets to paint. I added some bits to the front of the command car as it looked a bit flat. The whole thing is a really long model that will dominate a games table. With three Stug/Pugs supporting, the opposition will be in trouble. 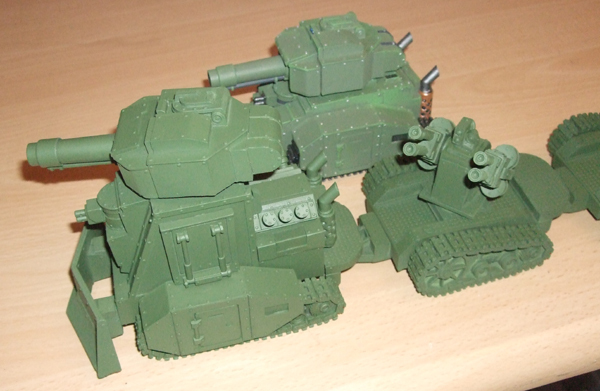 When the Rivet Wars board game arrived, I instantly took a like to the Allied artillery, a nice big chunky model that I thought would fit in nice with the Imperial Meridian army. Rather than butcher one of the models from the board game, I kept an eye on eBay and managed to pick up a couple of spares for butchering. Having removed one from the standard base, I glued the loose pieces so the wheels and rear stabilisers were fixed and thought about mounting it on a round base. This is the sort of thing I wanted the engineer conversions for, to crew some funky steampunk weapons. These two are Hasslefree Jotun models that I have wanted to finish for years. And I do mean years. When I actually started painting them, I found there was way more detail than I was anticipating, so they took longer than I thought. As I was going along, I was not really happy with the way they were looking, far to bright for undead. Even when the ink was going to be applied they looked like they would be too light. Nothing to do but carry on. When the Army Painter Dark Tone ink was applied it calmed them down a lot and I guess they will do. These will be used as Praetorian Stalkers in my retro Dark Legion army that is currently in the works. 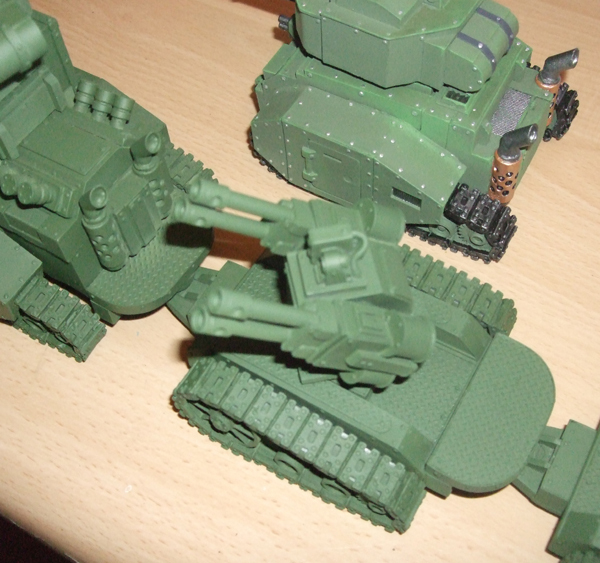 They may not look a great deal like the Prodos models, but they are big and armed with HMG’s, so they work for me! The first of the Dark Legion cannon fodder are finished, just a few basic Undead Legionnaires to start the squad off. I’m going to need a bunch of these chaps, enough for two small squads and some spares. One of the great things about painting this type of model is that you don’t have to stick to a uniform, anything goes and you can slap on any colour you fancy. So I did. 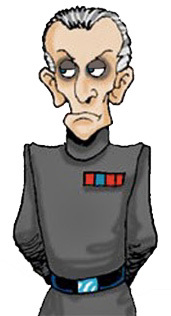 That does mean you end up with an odd mix of models but it won’t matter, I can’t see them lasting long in a game.